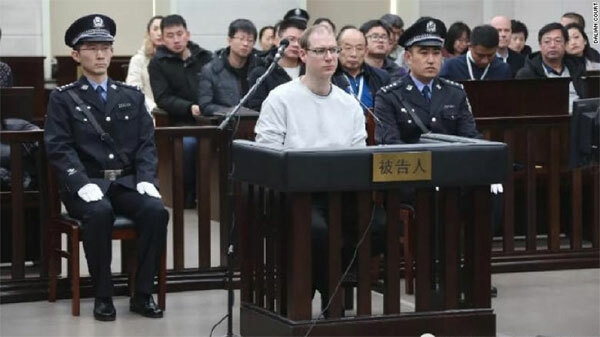 A Canadian citizen in China has been sentenced to death after a court convicted him of drug smuggling on Monday, a move likely to further inflame tensions between Ottawa and Beijing. Schellenberg and an accomplice bought tools and tires in an attempt to repackage the drugs before shipping them out in containers, according to the prosecution. Robert Lloyd Schellenberg, photographed in Dalian Intermediate People's Court. The Canadian was said to have inspected the cargo, assessed the workload and decided on a shipping date. After his accomplice turned himself into the police, Schellenberg fled Dalian and was arrested in southern China on December 1, 2014, when he tried to fly to Thailand, the court said. "I am not a drug smuggler. I came to China as a tourist," Schellenberg said Monday before the verdict was announced, the AFP news agency reported. The court said Schellenberg is entitled to appeal his verdict and sentencing within 10 days. The court added that his rights to defense and translation were protected during the trial and officials from the Canadian embassy were in attendance. Schellenberg's uncle told CNN the family was in shock over the ruling. "We don't know how much to talk about right now and what to say. We are all very heartbroken right now and we are all in shock. We are just overwhelmed," Gary Schellenberg told CNN by phone. Schellenberg went on to say the family is in close contact with Global Affairs Canada but have not had any contact with his nephew. The Schellenberg family released a statement Monday asking the Canadian government to protect its citizens. "The Schellenberg family cares deeply about our Robert who is being held under very difficult circumstances in China," the statement read. "As a family we are communicating with our Member of Parliament, Mr. Ed Fast, who is working hard on our behalf to ensure that the Trudeau Government makes every effort to secure fair treatment for Robert. "The Schellenberg family requests that all Canadians stand with us and pray for the safe return of our loved one." Trudeau said the Chinese court's decision was "of extreme concern." "It is of extreme concern to us as a government, as it should be to all our international friends and allies, that China has chosen to begin to arbitrarily apply the death penalty in cases facing, as in this case, facing a Canadian," Trudeau said in a news conference following Monday's ruling. Schellenberg was first tried in March 2016 and was convicted of being an accessory to drug smuggling in November 2018. Upon receiving a sentence of 15 years in prison, he appealed the verdict. A high court ordered a new trial in late December 2018 when the prosecution said they had uncovered new evidence to prove Schellenberg's principal role in the case. Schellenberg's conviction and sentencing came amid worsening diplomatic tensions between the two countries after Canadian police detained top Huawei executive Meng Wanzhou on December 1. Meng, who is also the daughter of the Chinese tech company's founder, has since been released on bail pending an extradition hearing to the United States on charges of violating sanctions against Iran. Since her arrest, multiple Canadian citizens have been detained in China. Guy Saint-Jacques, Canada's ambassador to China from 2012 to 2016, said he believes China is making an example out of Schellenberg. "I have recently heard a word repeatedly pronounced by some Canadians: bullying. They said that by arresting two Canadian citizens as retaliation for Canada's detention of Meng, China was bullying Canada," the ambassador wrote last Wednesday in The Hill Times, a Canadian publication. "To those people, China's self-defense is an offense to Canada. If someone slaps you on your left cheek, give him your right cheek, they told us. But I have never seen them doing as they said." Saint-Jacques said Schellenberg's conviction is "confirmation that we're going through a crisis." "Of course, the government will ask for clemency," he said. "I would add also that Mr. Schellenberg claims that he was framed and that he never dealt with drugs"
China severely punishes those caught smuggling or trafficking drugs, including foreigners. Anyone found with more than 50 grams (1.76 ounces) of a controlled substance can face the death penalty. "The administration of justice is not the same in China and the way that they collect evidence would not be acceptable in North American tribunals," he said. He said that it was normal for China to invite foreign journalists to attend the trial. Canada updated its travel advice for citizens traveling to China Monday. The advice states that citizens should "exercise a high degree of caution in China due to the risk of arbitrary enforcement of local laws." "The decision to travel is your choice and you are responsible for your personal safety abroad," the advisory read. "We take the safety and security of Canadians abroad very seriously and provide credible and timely information in our Travel Advice to enable you to make well-informed decisions regarding your travel abroad." In 2009, Akmal Shaikh, a British citizen convicted of carrying up to 4 kilograms (8.8 pounds) of heroin, was executed by lethal injection despite fierce protests from the UK government and his family, who said he suffered from a mental disorder and was tricked into carrying the drugs. According to China.org.cn, a government-run website, at least 12 foreign drug dealers have been executed in China since 2000, "and other foreigners were sentenced to death for other serious crimes." China remains the world's top executor, according to international monitors, though the country does not publish detailed statistics. VietNamNet Bridge – Customs officials in HCM City discovered 40 shipments of various drugs in the first six months of 2018 and seized 54.5kg.